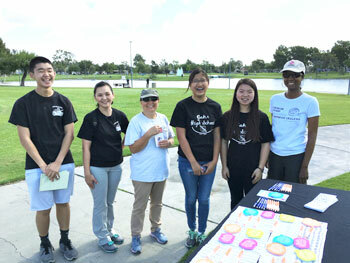 Advanced Placement Environmental Science and Honors Biology teacher Ms. Quyen Vu and 20 GSP students are implementing a new local sustainability project that they established in collaboration with the California Department of Fish and Wildlife. They are testing water quality and identifying/monitoring invasive species in the lakes at the above locations. They are also conducting weekend public education programs at the parks that they designed to change visitor behavior, thereby reducing invasive species and improving water quality of the lakes. Until now, the Department of Fish and Wildlife lacked the resources to pursue conservation and environmental education efforts at these parks. The GSP students and Ms. Vu were recently selected to participate in the 2016/17 Global Sustainability Project through a competitive application process. They will contribute 40 hours or more to their research and public education activities at the parks throughout the summer and fall. They plan to present findings of their research and evaluate the effectiveness of their public education efforts at the end of the year. In summer 2017, Quyen will lead 10 of the GSP students on a research expedition to assist Earthwatch scientists in fieldwork aimed at conserving endangered rhinos at Mankwe Wildlife Reserve in South Africa.